The government’s last minute climb down on attempts to limit the new Freedom of Information (FOI) bill it is currently bringing into law has to be welcomed. Having used FOI on local issues myself it is a vital part of democracy. 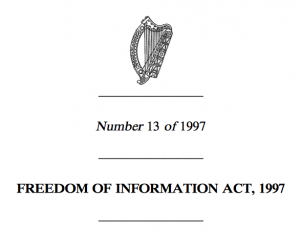 Fine Gael and Labour had promised to reform Freedom of Information when they entered government. They promised to make government more open by removing fees and making the business of state more transparent. However they actually tried to do the opposite when at the last minute Minister Howlin added a number of amendments to the Bill which would have had the effect of putting FOI requests out of financial reach for most journalists and requesters.